Friday, July 20, 2018 - The Summer 2018 update to the National Transportation Atlas Database (NTAD) was released today with 13 revised datasets. Intermodal Passenger Connectivity Database (IPCD) layer. Bikeshare layer. As of May 2018, there were a total of 106 bikeshare systems available to the public that are fee-for-service systems with fixed, IT based stations. Between May 2017 and May 2018, 18 new bikeshare systems launched. Since the previous edition of the Bikeshare layer, there have been 1,220 docking stations added. Rail data including Amtrak Routes and the North American Rail Network (NARN). The Amtrak Routes layer has been streamlined, making it easier to query and analyze its features. Airport data, including 2018 airport facilities and runways. Congressional District data identifying newly elected members of Congress. 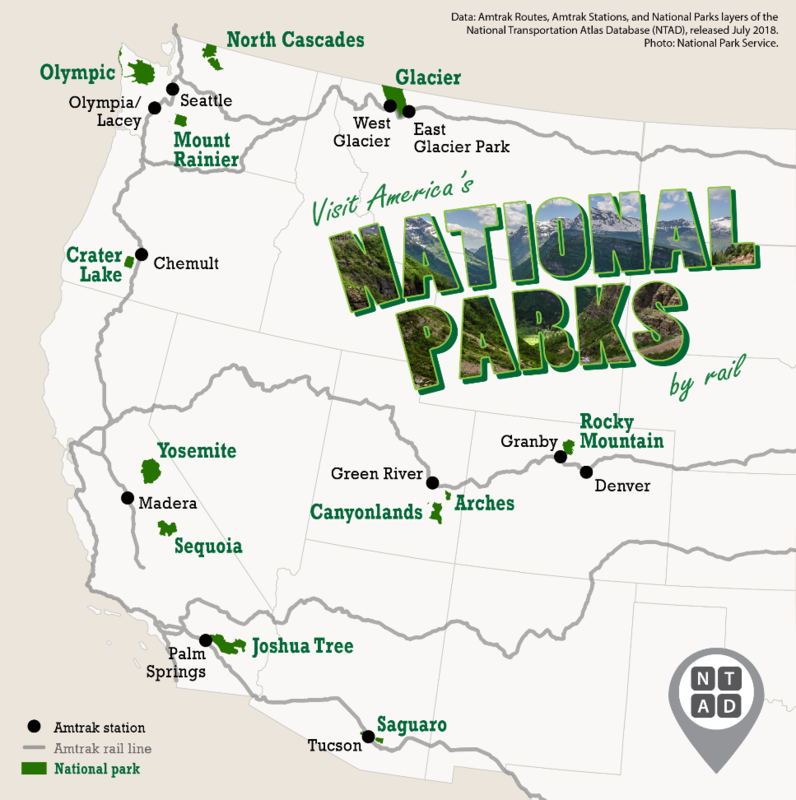 National Park Boundaries from the National Park Service. NTAD is available for download in comma separated values (CSV), Keyhole Markup Language (KML), and shapefile formats, through the BTS Geospatial Data Catalog. Additionally, Open Geospatial Consortium (OGC) standard Web Feature Services (WFS) are available for most NTAD datasets. BTS now uses a dynamic NTAD publication cycle, making updated data available throughout the year when they become available from their respective government agencies. See @TransportStats on Twitter for announcements of additional dataset releases throughout the year. Contacts: Press: Dave Smallen: (202) 366-5568. For technical information and questions: Dominic Menegus: (202) 366-8717.